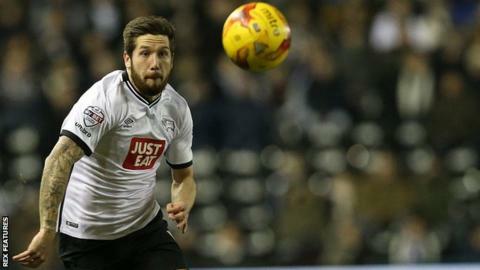 Jacob Butterfield says confidence has returned to Derby County's play after successive victories under new head coach Darren Wassall. The Rams beat Brentford 3-1 on Saturday and followed it up with a 1-0 home win over Blackburn Rovers. Tuesday's matchwinner Butterfield, 25, told BBC Radio Derby: "The last two performances have been very positive. "We have such good players. If we are all at it we are going to beat anybody in this league." Derby are now fifth in the Championship table - just six points adrift of leaders Hull City - despite having gone eight matches without a league win before beating the Bees. Butterfield, whose side host Wolves at the iPro Stadium on Saturday, said Wassall has given the players "freedom to express themselves". "He wants us to get on the ball, show courage, and play when we can play," added Butterfield. "It's quite a simple message. "The lads are responding to that. We have been on the front foot, very aggressive and quick with our play. We have got two great results and we are very pleased. "It's back-to-back wins and we go to Wolves full of confidence. If we can get a win it will be a fantastic week. "We had not won for eight games and had dropped off the pace a bit, but we are still in a fantastic position."